Marc Marut wears red high top Converse “Chuck Taylor” All Stars in the film. Johnny McFarley delivers more than the newspaper in The Paperboy. The Paperboy is a Canadian made horror film providing us with a new twist on the typical plot formula “beware of the nice kid next door”. Johnny McFarley (Marc Marut) is a 12 year old who on the outside projects the image of the all-American boy. He is a paperboy with a friendly and eager-to-help demeanor — the kind of kid you would imagine to be a boy scout or shortstop on the Little League team. But underneath this wholesome appearance, Johnny is seething with a psychotic-obsessive personality that cannot deal with any kind of rejection. In the opening scene, you see Johnny sneak into the house next door and murder the old lady inside. Although at first this seems senseless, you soon learn that this action is all part of Johnny’s plot to lure the lady’s divorced daughter Melissa (Alexandra Paul) and granddaughter Cammie (Bridget Tierney) to the small Ohio town where Johnny lives so that he can become part of their family. Johnny’s mother recently died, and he doesn’t get along with his often-absent father, so Johnny has become obsessed with Melissa and Cammie from seeing them on videotapes and through pictures in a family album which he has cut up, copied, and added himself to. Johnny drives Melissa to her wits end trying to insinuate himself into her family. When Melissa arrives for her mother’s funeral, she is at first pleased by the attention that Johnny pays to her and Cammie, but is soon put off by his aggressive and persistent manner. Johnny is always hanging around the house, doing chores without being asked, and trying to be a participant in all of their activities. He is constantly spying on them and has even planted a radio transmitter in their house so he can hear what they are saying when he is not around. He is jealous of anyone else who spends time with Cammie or Melissa and plots revenge for anyone who has something bad to say about him or gets in the way of his plans to become part of Melissa’s family. On his list are Brenda (Karen Dwyer) a local teenager who tells Melissa that Johnny spied on her while she was babysitting Cammie and later sprays him with a hose, Brian (William Katt), an old school flame of Melissa who rekindles their romantic relationship, Mrs. Rosemont (Frances Bay) an elderly neighbor who knew the McFarley family and tells Melissa that Johnny has the “mark of Cain”, and even his father (Barry Flatman), who wants to leave town and start up a new life. We learn that Johnny had a difficult and abusive love-hate relationship with his mother, and that her death was caused by falling down the cellar steps, circumstances that seem now seem suspicious. Melissa doesn’t want to believe all of the negative information that she learns about Johnny, but eventually becomes frightened by Johnny’s behavior and arranges a legal hearing to have Johnny put into foster care where Mrs. Rosemont will testify about his abuse. Unfortunately, she doesn’t know that Johnny can hear her through the radio transmitter when she tells Brian what she is going to do, so her action sets up the final horrific conflicts between the characters that completes the film. Johnny pays a lot of attention to young Cammie so that she will have a good opinion of him. While The Paperboy is somewhat predictable in terms of its “B” horror movie plot and format, there is a lot of craftsmanship used in making the film that allows it to be scary and yet have character development at the same time. Director Douglas Jackson and screenwriter David Peckinpah make Johnny into a complete character by showing us many sides to his personality, not just his ruthlessness, but his charm, intelligence, and frustration. His ability to improvise, think on the run, and manipulate adults provides the storyline with some real suspense and disturbing horror. Marc Marut does an outstanding job of portraying these layers of personality, which range from a likable and engaging wholesomeness to that of a cold-blooded killer. He has a real adolescent sound to his voice which can sound ingratiating or grating as his demeanor switches from the likable boy next door to a frustrated psychotic, screeching with rage and anger. Alexandra Paul’s portrayal of Melissa goes beyond the usual parent without a clue role, as her schoolteacher past of working with troubled kids in Boston causes her to try to help Johnny instead of just calling the police. And even other conventions, like the nightmare scenes have some unusual twists to them. Although shown in Canadian theaters, The Paperboy was given a direct-to-video release in the United States, which is too bad, because it certainly is a better film then some of the recent horror films that have been released since, and is definitely worth a look on video. Johnny checks to see if he has knocked out Brian. 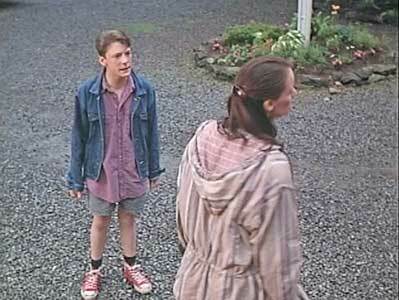 The Paperboy uses shots of Johnny’s red hightop chucks throughout the film as a way of building suspense and at the same time giving a sinister aspect to the classic American sneaker. Director of Photography Rodney Gibbons takes this approach from the very opening of the film. At first, we never see Johnny’s face at all, just shots of his chucks as he rides a bike, walks on the lawn, climbs the stairs and then proceeds to commit a vicious murder. Johnny even has a Chuck Taylor key ring which he uses to unlock the door of the house. 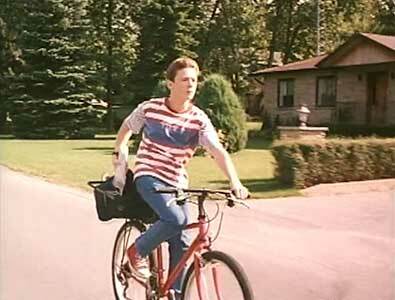 Then immediately after this violence, we are shown Johnny getting on his bike, delivering papers, and behaving like a normal, friendly kid you would see wearing a t-shirt, jeans, and hightop chucks. These sudden personality shifts are an important element of the film as the normal behavior of your typical paperboy are contrasted with Johnny’s psychotic episodes. We also find out later in the film that red is Johnny’s favorite color, and it’s clear that he likes his red chucks which he wears throughout the film with extra long laces that are wound around the outside of his hightops (see above picture). Converse Canada is given a credit at the end of the film, so just like Ice Cream Man, the Converse Company has contributed to the production of a horror film, and the presence of Johnny’s red Chuck Taylors provides a major visual impact to the film. These chucks closeups are the clearly the best chucks scenes, and if you click on the thumbnails below, you can see some of these shots. his personality or to build suspense prior to some horrifying action. The Paperboy. (1994) Alexandra Paul, Marc Marut, Brigid Tierney, William Katt, Frances Bay, Krista Errickson, Barry Flatman.